Yes, We Have A Mascot! 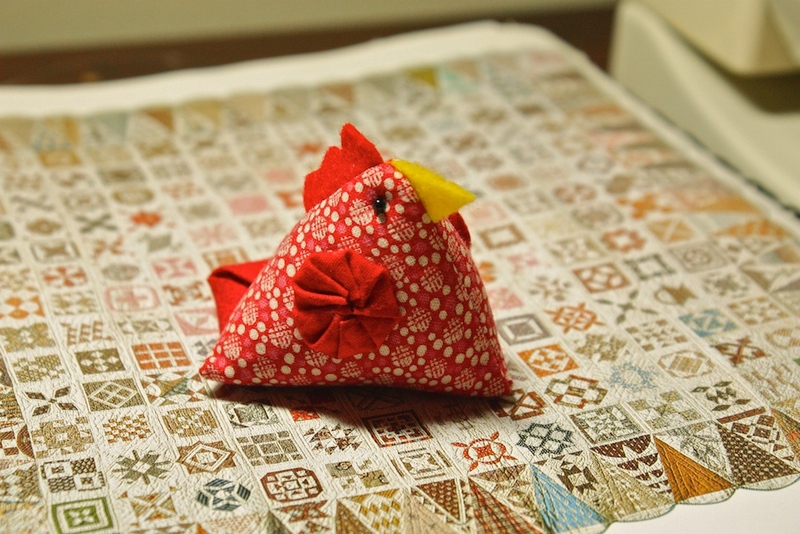 Diane gave me this totally adorable, teeny, red & white chicken pincushion this afternoon. I am just IN LOVE. By the time I got home, after a nice chatty subway ride with Diane, I knew that she simply had to be our project mascot! Her name is Semper Tedium, because, well, just because. Very exciting news of the evening: All the blocks are now spoken for!!!! Newcomer Samantha Rowan grabbed the last block (H-8, Eaton’s Crossroads). Thank you so, so much, Samantha! We are also hoping to do the four corner kites, although I’m a few weeks away from needing them. The plan is for the outside triangles to be solid red and white, with the corner kites being pieced/appliqued according to the original design. So, if you’re interested in doing one, please let me know – but also know that I won’t need them until early November. In the meantime, I’m piecing rows as fast as I can, and looking forward to getting the last blocks from those who are still working on them. I’ll be at the evening DJ class on Friday, so if you drop off blocks before then, it would be great.